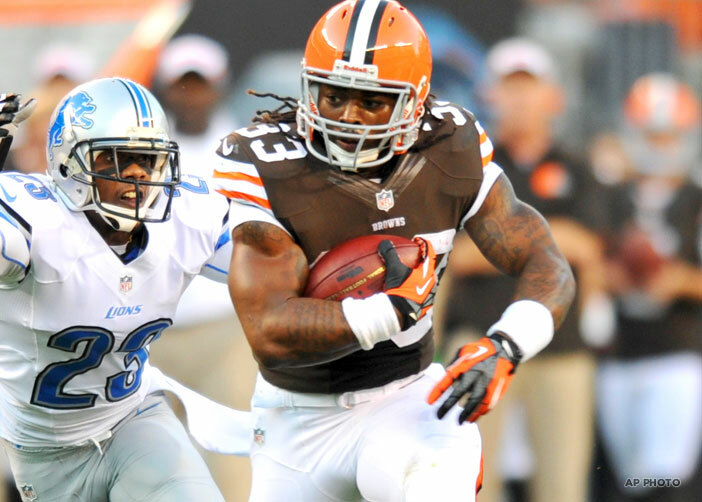 The Indianapolis Colts today acquired running back Trent Richardson in a trade with the Cleveland Browns in exchange for the Colts’ first-round selection in the 2014 NFL Draft. Richardson, 5-9, 225 pounds, has started all 17 games for the Cleveland Browns since being selected third overall by the Browns in the 2012 NFL Draft. For his career, he has totaled 298 carries for 1,055 yards and 11 touchdowns, while adding 58 receptions for 418 yards and one touchdown. In 2012, Richardson recorded 950 rushing yards and 11 touchdowns while posting three 100-yard rushing performances. He also caught 51 passes for 367 yards and one touchdown. In three seasons at the University of Alabama (2009-2011), Richardson helped the school capture two national championships in 2009 and 2011. He recorded 3,130 career rushing yards and 35 touchdowns on 540 attempts (5.8 avg. ), while adding 68 receptions for 730 yards and seven touchdowns. He also returned 28 kickoffs for 720 yards with one touchdown.